Our pets are considered valued members of the family. Whether they walk on all fours, have wings, or have gills, they are loved just the same. From aquarium add-ons to the tastiest food for your feline counterpart these 10 best pet stores in Wisconsin have you covered! La Crosse’s very own Moore Pet Supplies is a great place to stock up on all your pet accessories. For more than 75 years they have been supplying tons of pet loving families with pet doors and flaps. Doors can be custom made for specific animals like turtles or cats and they offer doors for all different areas around the house. Front door, garage door, porch door, you name it. Alisha’s Best of Friends Pet Care does it all. Located in Dodgeville, Wisconsin, you can find pet boarding, grooming, daycare, training, and pet supplies. They have a large selection of inventory at a competitive price point. Enroll your pup in fun summer sessions starting from puppy age to older dogs. The newly opened location of Happy Tails Pet Supplies in Franklin is a hit around the Milwaukee area. Come visit their store and get a free treat! They’ve put the time and research into all of the foods that they sell—making sure your animals get the best of the best! MadCat has been voted “Madison’s Favorite” pet store for 10 years in a row. They offer three area locations and is your trusted source for food and pet supplies. Contrary to their name MadCat isn’t only for our feline friends. They offer advice and toys for our dog friends as well! Purchase and rescue animals at Animal World Adventures. 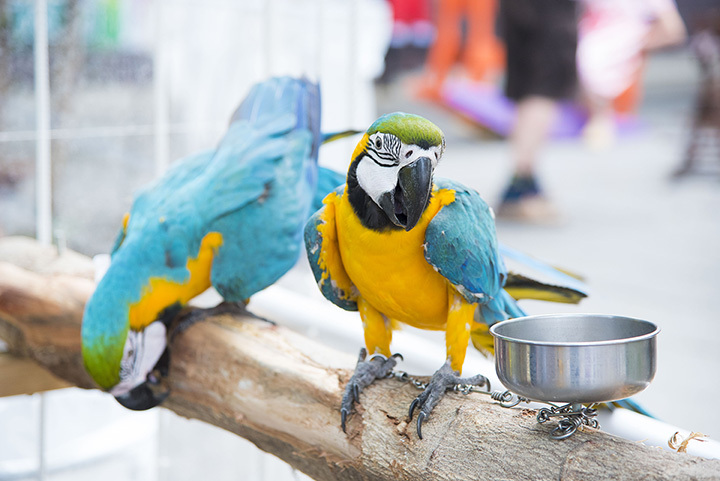 They sell all types of animal food and carry a wide variety of accessories for your furry, feathery or scaly friends. Enjoy firsthand knowledge from some of the best in the business and see why the more you buy the more you save! You’ll find the best customer service at Racine’s Havahart Pets. Inventory ranges from pet apparel, collars, food, treats, and more. They are well known for their superb pet grooming. They welcome all cats and dogs of any size and breed. Give your companion the royal treatment! Just Pets is the perfect place for small animal shopping and needs. They have a large selection of freshwater and salt water fish. Check out their birds, reptiles, rabbits, and guinea pigs. Grooming services are available along with habitat set ups, and training! Knowledge is power at Katzenbarkers Natural Pet Food and Supplies. They have found the best food and treats on the market for your animal companions to ensure a healthy life. Shop their stores for tons of accessories or sign your furry friends up for a grooming package with tons of add-ons. “Think Outside the Bag” at Bark N’ Scratch Outpost in Milwaukee. Since 2006 they have been offering pet owners the opportunity to provide healthy diets for their four legged companies. Barn N’ Scratch offers tons of inventory supplies. Come see why they have been voted “Best of Milwaukee” time and time again. Noah’s Ark Pet Center is a family pet owner favorite in the Madison area. Since their open in 1969 many have depended on Noah’s to provide the best food on the market at affordable prices. They offer obedience classes and a wide variety of products and services for your companions.